Binham Priory was founded in the early 12th century, and is an important example of the almost complete survival of a monastic precinct. The cloisters and gatehouse are in ruins, but the church, which is still in use as a parish church, is upstanding. The buildings date mostly from the 13th or 14th centuries. Earthworks of other buildings survive within the precinct, including possible guest accommodation and agricultural buildings. A complex water management system has also survived, including the remains of fishponds. An evaluation to determine the location of the lost west precinct wall by APS in August 2007 located the line of the inner face of the medieval wall along with evidence for structures located against the wall. Medieval and post medieval pottery, ceramic building material and animal bone fragments were also recovered. In 2009 an evaluation revealed two graves pre-dating the 12th century north aisle, which may have belonged to an earlier church possibly of Saxon date. Benedictine priory, founded at the end of the 11th century and dissolved in 1539. Gatehouse dating to 15th century. Priory church, partly ruined, 12th and 13th century date. Ruined cloister and conventual buildings, including dormitories, garderobes, chapter house, refectory, with dates between the 13th and 15th centuries. Outer court with earthworks of buildings, possibly guest accommodation, and agricultural buildings. One of the few monasteries in Norfolk where the precinct has survived almost intact. Scheduled area greatly extended 1996 to include earthworks of water mill and fish pond. Standing post medieval barn. 1860. Ring and thimble found. 1936. Priory excavated. See drawings (S16, S17, S18, S19 and S20) in the Illustration Library for finds from this excavation. Carried out in the external angle of the west and south ranges, this revealed a thick flint and mortar raft, however there was no evidence of a building that occupied this angle. Overlaying this was an early 16th century midden which contained large quantities of animal bone and oyster shell. The only pottery that was found in association was German stoneware. 1987. Found with metal detecting, medieval metalwork. See full details, schedule sheet and illustrations in file. Ministry of Works plans of buildings are large rolled plans. E. Rose (NLA) 21 August 1996. 2004. Guide book published (S10). D. Gurney (NLA), 8 April 2009. Scheduled monument consent granted concerning repairs to the gatehouse and precinct wall. August 2005. APS excavation within the footprint of the north aisle. Contexts 100-143. Medieval deposits comprised the flint and limestone wall of the north aisle of early to mid 12th century date set within its foundation trenches. Three sub-phases of the aisle wall were recorded, based on differing foundation designs exposed during excavations. Later buttresses were also cleaned and examined and include limestone plinths and rendered flintwork. Though not securely dated, one buttress incorporates reused 12th and perhaps 13th century stonework. This reused material may derive from the 14th-15th century rebuilding of the east end of the church and the chapter house. No foundation trenches were visible beneath buttresses. Possibly also of medieval date is the insertion of an opening in the 9th bay of the aisle. Mixed graveyard soils, burials and a wall remain undated. Burials, where encountered, had no indication of associated grave cuts and the structure of graveyard soils was mixed due to repeated interment. Also undated is the infilling of the inserted opening within the 9th bay of the aisle. For further details see (S4). 4 January 2006. On surface of spoil heap from 2005 excavations, spread in area centre TF 9815 3999. One body sherd Thetford-type (weighing 8g) and one body sherd medieval unglazed (8g). Fairly numerous small fragments of medieval ceramic roof tile were noted but not collected. A. Rogerson (NLA), 4 January 2006. This is one of the sixty five churches selected for (S5). Excavation of single trench in order to expose the remains of the collapsed portion of the precinct wall. Context 200 - 220. The line of the inner face of the medieval precinct wall was located, along with evidence for structures located against the wall. Medieval and post medieval pottery, ceramic building material and animal bone fragments were recovered. E. Bales (NLA), 23 May 2008. 2007. Observations of precinct wall. E. Rose (NLA), 16 November 2007. May 2008. Watching brief during erection of interpretation panels. Contexts 500 onwards. 14th-15th century pottery, roof tile and demolition matter were recovered from the pits for the first interpretation panel located on the approach to the priory. Demolition rubble and medieval roof tile was also recovered from the second panel pit, located by the entrance to the priory. The north wall of the cloister alley was located in the third pit in the cloisters, and in pit four in the presbytery the foundation wall beneath the pillar was encountered. Medieval floor tile was also recovered from this pit. The medieval buttress wall was encountered, aligned east-west and constructed in flint with some limestone dressing. As no visible wall scar of the precinct wall was visible on the buttress, the precinct wall probably abutted against it. The medieval precinct wall was identified as a narrow trench-built flint structure, containing a single fragment of flat roof tile, which accommodated the east face of the wall. The western face was not identified, and the rubble core was also not present. Towards the northern edge of the trench were a number of levelling deposits which supported a surface of crushed chalk or fine mortar. The southern limit of this surface was marked by a cut, a possible foundation trench of an east-west wall. Further south was a flint wall, abutting the precinct wall, which was probably medieval in date. Post- medieval demolition deposits produced finds that comprised medieval pottery , 16th-17th century pot, tile and animal bone. H. White (NLA) 8 December 2008. 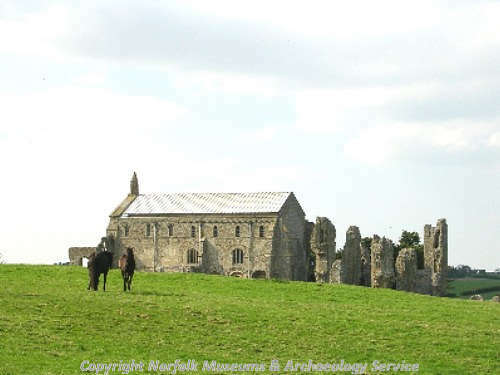 For details about the Binham Priory Access and Conservation Project by the Binham Priory Trust and the Norfolk Archaeological Trust, see (S9). D. Gurney (NLA) 20 March 2009. Conservation work to the gatehouse and buttress completed, as well as improved disabled access, a service building to display artefacts and the installation of information panels. H. White (NLA), 19 May 2009. Excavation of trenches ahead of development to provide a visitors centre and improved access to the site revealed medieval remains including walls from the north aisle and precinct wall. Pre-dating the construction of the 12th century north aisle were two graves, which may have belonged to a church possibly of Saxon date recorded in the foundation charter. The pottery assemblage comprises medieval and post-medieval sherds with residual finds of Roman pottery. Worked stone from the priory were also recovered and included a number of mouldings and three grave slabs with two made from Purbeck marble. Worked flint could suggest prehistoric activity within the vicinity. A report is being prepared on stone fragments from the English Heritage Norfolk store, possibly from a tomb canopy (S14). D. Gurney (NLA), 2 February 2010. --- Aerial Photograph: TF9839 A-D,H-Q,U-AB,AE-AU (Unit); R-T, (AAF). --- Article in Serial: Hudson, W. 1910. The Norwich Taxation of 1254. Norfolk Archaeology. Vol XVII pp 46-158. p 84. --- Article in Serial: Fairweather, F. H. 1931. Excavations in Norfolk; Summer 1930. Antiquaries Journal. XI No 2 pp 168-169. p 168ff. --- Aerial Photograph: TF 9839/ AW, AV. --- Article in Serial: Clapham. 1934. [unknown]. Journal of the British Archaeological Association. Vol 40, pp 44-7. --- Newspaper Article: The Times. 1936. Binham Priory Excavations.. 1 September. --- Newspaper Article: Eastern Daily Press. 1934. Excavations at Binham.. 14 July. --- Newspaper Article: Eastern Daily Press. 1936. Binham Priory - Mr H. R. Nevill's Lecture at Norwich.. 3 February. --- Monograph: Cushion, B. and Davison, A. 2003. Earthworks of Norfolk. East Anglian Archaeology. No 104. p 131. --- Unpublished Document: Cushion, B.. 1996. Binham Priory Earthwork Survey. --- Map: 1733. Map of Binham, copied from 1655 map. --- Map: 1815. Binham Enclosure Award. --- Map: 1792. Map of Binham. --- Newspaper Article: Eastern Daily Press. 1980. Binham Priory in 1928 - picture.. 8 December. --- Newspaper Article: Eastern Daily Press. 1985. Conservation film looks at Binham.. 3 January. --- Newspaper Article: Eastern Daily Press. 1985. Big target for repairs to small church.. 23 April. --- Newspaper Article: Eastern Daily Press. 1998. Care needed over Hall plan.. 7 January. --- Newspaper Article: Eastern Daily Press. 1986. Priory church of St. Mary and the Holy Cross - picture.. 14 March. --- Serial: Howard, F.E.. 1923. Archaeological Journal. 80, 334-5. --- Unpublished Document: NNDC. 2005. Norwich Diocesan Advisory Committee Report on a Visit.. 26 August. --- Unpublished Document: NNDC. 2005. Norwich Diocesan Advisory Committee Report on a Visit.. 27 September. --- Scheduling Record: DCMS. 2009. Scheduled Monument Consent. --- Newspaper Article: Eastern Daily Press. 2009. Ceremony marks £1m priory work.. 19 May. --- Unpublished Document: Eastern Daily Press. 2009. Award of excellence for £1m project to restore ruin.. 17 October. --- Newspaper Article: Eastern Daily Press. 2008. Gatehouse opens door to the past.. 1 February. --- Newspaper Article: Eastern Daily Press. 2009. Better late than never as church gets funding.. 22 January. --- Leaflet: Binham Priory: A guide to the Priory Church of St Mary and the Holy Cross, Binham, Norfolk..
--- Newspaper Article: Eastern Daily Press. 2010. On the trail of fascinating church history. 18 October. --- Article in Monograph: Thurlby, M.. 1991. The West Front of Binham Priory, Norfolk, and the Beginnings of Bar Tracery in England.. England in the thirteenth Century III: proceedings of the 1989. Ormrod, W.M. (Ed). --- Leaflet: Anderson, J.. 2009. The Priory Church of St Mary and the Holy Cross, Binham: A reflective prayer guide..
--- Monograph: Hart, S.. 2010. Medieval Church Window Tracery in England. p 18. --- Article in Serial: Gurney, D & Hoggett, R. 2009. Excavations and Surveys in Norfolk in 2008. Norfolk Archaeology. XLV Part IV pp 570-578. p 570. --- Photograph: Photarc Surveys. 2008. Photographs of Binham Priory Gatehouse (bull pen enclosure).. Colour print. 1:20. --- Article in Serial: Fernie, E. 1980. Binham Priory. Archaeological Journal. Vol 137 p 329. --- Archive: Heywood S. (HES). 2004. Norfolk County Council Site Visit Record - Binham Priory Gatehouse. --- Archive: Clarke, R. R. and NCM Staff. 1933-1973. Norwich Castle Museum Record Card - Medieval. Binham. <S2> Article in Serial: Wilson, D. M. and Hurst, D. G. 1966. Medieval Britain in 1964. Medieval Archaeology. Vol IX (for 1965) pp 170-220. p 181. <S3> Scheduling Record: DCMS. 2005. Scheduled Monument Consent. <S4> Unpublished Contractor Report: Cope-Faulkner, P. 2005. 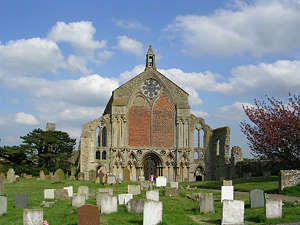 Archaeological Project Services Report No. . Assessment of the Archaeological Remains from Investigations at Binham Priory, Binham, Norfolk.. Archaeological Project Services. 149/05. <S5> Monograph: Jenkins, S.. 2000. England's Thousand Best Churches..
<S6> Unpublished Contractor Report: Cope-Faulkner, P. 2008. Interim Report: The Precinct Wall, Binham Priory, Norfolk. Archaeological Project Services. 116/07. <S7> Unpublished Contractor Report: Cope-Faulkner, P. 2008. Recording of Pits for Interpretation Panels at Binham Priory, Norfolk. Archaeological Project Services. 77/08. <S8> Unpublished Document: Cope-Faulkner, P.. 2007. Archaeological Project Services Report No. 116/07. Interim Report: The Precinct Wall, Binham Priory..
<S9> Website: The Priory Church of St Mary and the Holy Cross The Priory Church of St. 2009. www.binhampriory.org. <S10> Unpublished Document: Binham Parochial Church Council. 2004. The Priory Church of St Mary & the Holy Cross and the Monastic Precinct, Binham, Norfolk..
<S12> Unpublished Document: APS. 2009. Archaeological Project Services Report No. 137/08 Assessment of the Archaeological Investigations undertaken at Binham Priory, Binham..
<S13> Article in Serial: Gurney, D. and Hoggett, R. (eds). 2008. Excavations and Surveys in Norfolk in 2007. Norfolk Archaeology. Vol XLV Pt III pp 441-452. p 441. <S14> Verbal Communication: Peter Wade-Martins. 2010. <S15> Article in Serial: Gurney, D. and Penn, K. 2006. Excavations and Surveys in Norfolk in 2005. Norfolk Archaeology. Vol XLV Pt I pp 124-136. p 124. <S16> Illustration: Gibbons, J. 2009. Drawing of a medieval figurine of the Virgin Mary.. Film. 1:1. <S17> Illustration: Gibbons, J. 2009. Drawing of a medieval book fitting or mount fragment.. Film. 2:1. <S18> Illustration: Gibbons, J. 2009. Drawing of a medieval/post-medieval balance or scale arm.. Film. 2;1. <S19> Illustration: Gibbons, J. 2009. Drawing of a medieval/post-medieval copper alloy stamped sheet.. Film. 2:1. <S20> Illustration: Gibbons, J. 2009. Drawing of a post-medieval copper alloy stamped sheet.. Film. 2:1.